Alastair Seeley won the opening Superbike race on the Tyco BMW. 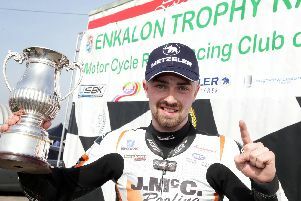 Alastair Seeley was in imperious form as the Ulster rider completed a fabulous treble on Saturday at the Vauxhall International North West 200, extending his all-time record to 21 victories. Seeley won four races in all at the 2017 meeting, opening his account in the Superstock race on Thursday evening. The Carrick man picked up where he left off as Seeley prevailed in a damp Supersport race on Saturday morning, making amends after he retired from Thursday’s race on the Gearlink Kawasaki. Alastair Seeley leads Ian Hutchinson and Lee Johnston in the Superstock race at the North West 200. He won the race on the ZX-6R from William Dunlop and Michael Dunlop on their Yamaha machines, taking the flag with four seconds in hand for his 19th Triangle Triumph. Tobermore’s Adam McLean rode a brilliant race to finish fourth on his Kawasaki ahead of Ian Hutchinson on the McAMS Yamaha, with James Hillier sixth on the JG Speedfit Kawasaki. A delay of three hours ensued after an oil leak on the Coast Road combined with heavy rain led to unsafe conditions. Eventually, the opening Superbike race went ahead shortly before 3pm in the wet, when it was reduced in distance from seven laps to four. Seeley was simply a cut above in the conditions on the Tyco BMW as the 37-year-old quickly took control and pulled away. He stretched his lead on each lap and won commandingly by more than 21 seconds from Michael Rutter (Bathams BMW) to secure his 20th victory at the seaside meeting. Alastair Seeley celebrates his Supersport victory with runner-up William Dunlop (left) and Michael Dunlop. Lee Johnston, who crashed out in the opening Supersport race at Juniper chicane, sealed a rostrum on the Jackson Racing Honda, with the top six finalised by Glenn Irwin on the PBM Ducati, who passed Peter Hickman (Smiths BMW) on the final lap. Derek Sheils was a strong sixth on the Cookstown BE Racing Suzuki. Seeley’s scintillating run continued as he won the Superstock race to make it a double in the class after his win in Thursday’s race. A five-rider battle developed for the lead but it was Seeley who used his vast experience and race craft to good effect, earning his 21st North West 200 win by 0.2 seconds from team-mate Ian Hutchinson after the race was stopped on the fifth lap as the rain began to fall. The result was taken from the end of lap four, with Michael Rutter completing a 1-2-3- for BMW on his Bathams machine. Michael Rutter with KMR Kawasaki team owner Ryan Farquhar after his win in Saturday's Supertwins race at the North West 200. Lee Johnston (East Coast BMW) was fourth ahead of Peter Hickman (Smiths BMW), with Dean Harrison the first non-BMW rider home in sixth on his Kawasaki. Event favourite Rutter claimed his 14th win in the Supertwins race as he beat Dan Cooper and Thursday’s winner Martin Jessopp. Rutter took the honours for Ryan Farquhar’s KMR Kawasaki team on an emotional day for the Dungannon team owner, who was left fighting for his life after a crash in the Supertwins race at the North West in 2016. Runner-up Cooper was also caught up in Farquhar’s crash last year and put the incident behind him with a fine ride to second place.